Machines come and go in the motorcycling world. Times change, as do riders and their expectations. But since 1975 there’s been a bike in the Honda range that has stood the test of time – the Gold Wing. It’s evolved, of course, but just as it was originally, it remains one of the most special experiences available on two wheels. And no other bike in Honda’s current line-up has been on sale for longer in Europe. Many riders are addicted to its avalanche of turbine-like torque, or its sheer handling poise at low – or high – speed. Some revel in its mileage-munching ability, carrying capacity and all-day two-up comfort. But all will agree on one thing – there really is nothing else quite like a Honda Gold Wing. And fittingly for such an astonishing platform the Gold Wing has spawned two other very special machines, broadening its attraction and appeal: the Gold Wing F6B, with its long, low and pared down ‘Bagger’ style and hot rod Gold Wing F6C, an unfettered street prowler that defines the term ‘Power Cruiser’. To mark 40 years of constant Gold Wing manufacture Honda has produced a 40th Anniversary machine, marking this milestone along what has become in motorcycling terms, one incredible journey. The Honda Gold Wing has always stood alone. Launched as the GL1000 in 1975 its horizontally opposed four-cylinder engine was not only physically different, it felt very different with a silky output perfect for long days in the saddle. A six-cylinder, 1500cc overhaul in 1987 saw the Gold Wing once again state its intent and purpose to benchmark the ultimate touring machine. The Gold Wing GL1800 which debuted in 2001, after eight years of intensive research and development, added further dynamic ability and riding enjoyment to the Gold Wing’s repertoire. The box-section aluminium frame delivered stability and accurate steering at speed. It also worked with the unique flat-six engine to keep the centre of gravity low – a key factor in the bike’s excellent low-speed balance and agility, which made twisting mountain roads or busy city streets a pleasure to negotiate. And just as the engine enjoys a legendary reputation for reliability, so the rest of the machine is finished to the very highest standards, with outstanding build quality and paint finish. The core appeal of the Gold Wing remains its unique ability to make long-distance travel a truly rewarding and enjoyable experience. A visual update in 2011 – with improved luggage capacity – under the style concept of ‘majestic aggression’ perfected a look that is at once elegant, imposing and vibrant. To celebrate 40 years of production the 2015 Gold Wing will be available in an additional – and very special – two-tone colour scheme, with commemorative key fobs and fairing/trunk badges. The 40thAnniversary badges and key fobs will also be found on the three other Gold Wing colours. The Gold Wing’s front fairing features a strong diagonal styling element that accentuates the strong lines of the twin-spar frame, running down the sides of the bike from the headlights to the pannier cases. The result is a dynamic look with sharp surfaces and sleek forms, sculpted by CFD (Computational Flow Dynamics) for reduces buffeting for rider and pillion. Total luggage capacity is 150 litres and the shape of the rear of the machine actively contributes to aerodynamic stability. A vehicle moving at speed naturally creates an area of negative pressure behind it. By better managing the movement of air over and through the rear of the bike, this negative pressure is reduced, increasing stability. 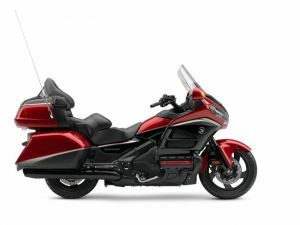 The seat is one of the most important features of a touring motorcycle and the Gold Wing’s has always excelled when it comes to day-long comfort. The shape of the seat wraps around the passenger, creating the sensation of complete comfort and security. A urethane seat material increases comfort, while the weather proof cover is perforated for a sporty look. Seat height of 740mm gives accessible ground reach. The 2015 Gold Wing 40th Anniversary model will be available in a very special Candy Prominence Red/Graphite Black paint option. Both colours are tied together, and separated, by a silver band inlaid with 40th Anniversary emblems and the effect – along with the blacked out wheels, frame forks, swingarm and mufflers – is simply stunning. Finishing details are the 40th Anniversary emblems on the fairing front and inner, trunk lid and key fob. Offering superb sound presence and quality, this system delivers high quality stereo technology. The engine room is a powerful 80-watts-per-channel amplifier capable of delivering clear, crisp sound, even at motorway speeds. The amp powers a full complement of six speakers, with two rear speakers, two front speakers and two tweeters. The result is a rich and full surround sound experience through either the speaker system or the optional headsets. In addition the RDS radio allows easy access to radio stations via the integrated handlebar controls. The audio system is compatible with iPod®, iPhone® and USB memory sticks, meaning riders can play MP3, WMA and AAC music files on the go. The system is fully integrated, giving full device control through the handlebars and displaying music file information on the main display. Controls on the central panel take care of switching between music sources (for example radio or USB), switching displays and selecting music while at a standstill. The USB port for connecting digital music devices is in the large lockable top box, which also features an interior storage case to hold the device on the move. The Gold Wing’s Navigation System offers fast and accurate functionality. The bright colour screen boasts a range of functions including lane assist and junction view, while optional voice-prompting further reduces the chance of taking a wrong turn. The system also offers points of interest information, including petrol stations, Honda dealers, hotels and restaurants. Easy to use controls ensure all of these features can be accessed easily and safely. Reception sensitivity allows the system to operate effectively even in areas with a poor signal, such as on roads beneath large structures or on mountain roads. On models not fitted with an airbag the handily placed front pocket has 2.8 litres storage space. It is ideal for storing sunglasses, wallets and mobile phones while on the move. Five-position heated grips and independently adjustable heated seats make touring a year-round possibility. The foot-warming system channels engine-heated air over the rider’s feet and is controlled by a fairing-mounted lever. The slow-speed, electric Reverse system is engaged with the simple push of the thumb control on the right handlebar. Lightweight electronic cruise-control system utilises a 16-bit ECU-based, motor-actuated throttle mechanism. A simple yet ingenious ratchet windscreen-adjustment system provides six settings over nearly 100mm of travel. The manually operated adjustable and closeable windscreen vent routes fresh air to the rider’s face or chest. Between the fairing pockets, top box and rear panniers, the Gold Wing boasts over 150 litres of luggage capacity. The specially designed luggage features a remote-control key lock, permitting pop-open rear trunk operation, remote lock/unlock for the trunk and panniers and a horn-actuated bike locator. If remote locking is attempted while a lid is open, the turn signals flash to alert the rider. The horizontally opposed SOHC 2-valve six-cylinder engine is as much a part of the Gold Wing legend as the name or the sales success. Unique in motorcycling, the 1832cm³ engine is the perfect long-distance ally. Its layout minimises engine vibration and helps create a low centre of gravity, reducing rider fatigue at speed and making the bike easy to handle at walking pace. At the same time the large displacement gives exceptional power and torque, especially in the midrange. Bore and stroke is set at 74mm x 71mm, with compression ratio of 9.8:1. Peak torque of 167Nm is delivered at just 4,000rpm, with power output of 87kW @ 5,500rpm. PGM-FI fuel injection ensures a crisp throttle response and low exhaust gas emissions. Together, the fuel injection system’s fine air/fuel ratio control, the three-way catalytic converter and the air injection system – that encourages the oxidisation of unburned gases – ensure that the Gold Wing easily meets EURO-3 emissions standards. For longer maintenance intervals, automatic adjustment for the silent cam chain has been retained. The engine’s power is transmitted to the rear wheel through a five-speed gearbox spinning the opposite way to the engine’s crankshaft. This cancels out the side-to-side torque reaction effect generated by longitudinally mounted engines. Fifth gear is an overdrive, offering very low cruising revs on a long haul for optimised comfort and reduced fuel consumption. Shaft final drive means no messy chain lubrication or adjustment. The skeleton of the Gold Wing is a twin-spar aluminium beam frame which holds the engine as a stressed member, improving its already outstanding levels of rigidity, while the design’s low weight and optimised weight distribution make it a joy to ride at any speed. Rake is set at 29.15°, trail 109mm. Overall dimensions are (L) 2,630mm × (W) 945mm × (H) 1,455mm with wheelbase of 1,690mm and kerb weight of 413kg (421kg airbag model). Both the 45mm cartridge front telescopic forks and Pro-Link single-side swingarm rear suspensionuse low-friction bushes, with the forks also benefitting from low-friction dust seals. Equipped with a two-position memory function, the computer-controlled, electric hydraulic-type adjustable rear suspension allows for quick adjustments to spring preload depending on load. The Gold Wing is fitted with Honda’s Dual Combined ABS. The Combined element of the system links the front and rear brakes to deliver the perfect balance of braking effort, whether the rider uses the front brake lever or the rear foot brake for high levels of deceleration in all situations. The ABS monitors front and rear brakes – a pair of 296mm discs and three-piston calipers at the front, and a ventilated 316mm disc and three-piston caliper at the rear. Braking effort is momentarily reduced should the system detect that a wheel is about to lock up. Hollow section 5-spoke cast aluminium wheels are sized (front) 18 x MT3.5 and (rear) 16 x MT5. They wear 130/70 R18 (63H) and 180/60 R16 (74) tyres respectively. In addition to the standard model, the Gold Wing is also available fitted with a fully integrated airbag, which represented an industry-first when introduced in 2006. The airbag module containing the airbag and inflator is positioned in front of the rider. The ECU to the right of the module detects changes in acceleration based on information it receives from the two crash sensors (one positioned on each of the front fork legs), to determine whether or not to inflate the airbag in certain frontal impacts. Note: all models fitted with airbag are also installed with satellite navigation. The versatility and visual appeal of the Gold Wing can be further enhanced with a range of genuine Honda accessories.